The gold price in rand terms just hit its highest levels since April this year. It has averaged around R16,400 per ounce for 2017, with a spike to R17,600 in April following Pravin Gordhan's axing. More recently, the rand has weakened following yet another unsuccessful vote of no confidence in President Zuma. At the same time, the dollar price of gold spiked with tensions between the US and North Korea rising and fear of war. This lead to an increase in the rand gold price from R15,905 on 17 July to its 14 August level of R17,171 (a 8% increase in three weeks). 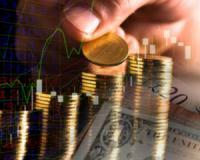 Pan African Resources stands to make massive gains from this increase in the gold price. A 8% increase in the gold price, like what’s just happened, means an additional R230 million in additional revenue for the company. On a per share basis that’s equal to 10.3cps additional profit or enough to add around R1 to the current share price of R2.50! And that’s not to mention that the company expects a 10% increase in gold production between today and 2018. Go to any gold mine and you’ll instantly recognise the massive mine dumps called tailings dams. These dumps are all of the material that’s been mined over years and years. These days most of the gold is removed from this material. But in years past a lot of gold wasn’t recovered from mined rock. At the moment Pan Af is ‘mining’ these dams, retreating the materials and removing gold from them. In 2013 Pan Af produced its first gold from the Barberton Tailings Retreatment Plant (BTRP) at its Barberton mine. This plant produces 20,000-30,000 ounces of gold a year at a production cost of less than $500 per ounce. And in February 2015 Pan Af started producing gold from its latest production facility at its Evander gold mine, the Evander Tailings Retreatment Plant (ETRP). This plant produces up to 20,000 ounces of gold a year at a cost below $600 per ounce. This latest project of Pan Af’s came in under budget and completed ahead of schedule. And the profits aren’t small either. Let’s do the math: The gold price is $1270. Cash costs to produce gold are $600. So Pan Af makes $670 per ounce of gold it produces. At 20,000 ounces that’s $5,200,000. And with the dollar at R13.30 that’s R178 million a year. What makes these tailings retreatment projects so great are that they are relatively inexpensive to build, but bring in lots of money. We’ve been dying to bring you the biggest, fastest gains from the new market rally, but we’re forced to stay mum. Pan Af has started construction of a new mega project. This single project will increase its gold production by around 25%. The all-in cost of production over the life of this project is estimated at $532/ounce. SO, considering the current gold price of $1270, this project could easily make an annual profit of R550 million. That means it would pay itself off in just a bit more than three years. On a per share basis that means additional 24cps earnings. The project is already fully funded. Pan Af raised around R700 million in equity from issuing new shares and another R1 billion in debt funding from RMB.Construction should be completed, with first production starting by the last quarter of 2018. 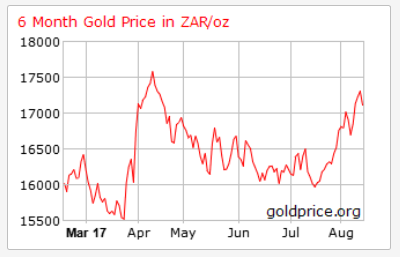 In the meantime, Pan Af’s existing mines are coining it from the high gold price. P.S: Retire a millionaire with the secret R10,000 Retirement Blueprint!